Enjoying home luxuries whilst caravanning has become increasingly popular. One of the most discussed is the use of satellite television. Though possibly a daunting task at first, by following a few straightforward steps you’ll be up and running in no time. 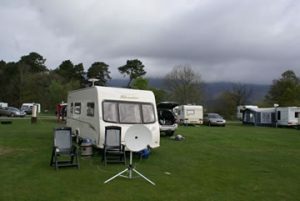 One type of caravan satellite set up worth considering is an EasyFind satellite. These take some of the hassle out of aligning your satellite by guiding you to the correct position. With a couple of clicks, and choosing which channel you want to watch, it uses a “traffic light” system to help guide you in the right direction. You then rotate the satellite slowly until the light glows a steady green and you’re ready to tighten up the dish in position and get watching. Our members have posted mixed reviews for these systems, with some saying they’ve had it up and running perfectly in no more than a couple of minutes while others have complained about unreliability and difficulty using it. It is important to research the type of caravan satellite suitable for you before investing. There are a number of different dishes including; Zone 1 dishes suitable for use in England and Wales and the larger Zone 2 dish for Scotland and Ireland. These are both very affordable, standard satellite options. As well as the EasyFind satellite there are also dishes designed specifically for touring which are more compact and can even fold for storage. However, these can be more expensive than other options. If you’re able to really splash out you may be interested in a semi or fully automatic dish. These can take a sizeable chunk out of your wallet but adjust themselves to the correct position, leaving minimal effort for you. As with all investments, it’s well worth shopping around and reading reviews. It is important to remember when positioning your caravan satellite that they don’t like trees or other obstructions as they block the signal. You should research the appropriate position of your satellite for your geographical location. This is easy to find online; www.dishpointer.com has very detailed list of satellites and relates them to your address. Firstly, pivot your dish to the appropriate LNB skew setting and lock it to the correct degree of elevation. If you have an offset dish you will probably need to aim below the satellite to obtain the best focal point. Next, use a compass (or the sun if you’re feeling adventurous) to approximate the dish alignment, or start from scratch facing dead South. Signal metres are very helpful at this stage and will greatly reduce the time it takes to find the satellite. These can be bought quite cheaply and should be connected at the LNB end. These will often give out a squealing sound when it receives a signal. It’s often a good idea to turn the volume down as it will squeal loudly as it finds a satellite. Then slowly move the dish towards the satellite until you receive the strongest signal and you can lock in the lateral (Azimuth) setting. Moving the dish a little at a time and then leaving it to rest for a few seconds is a very effective method, if you swing the dish from side to side you won’t find anything very easily. With larger dishes you need to be more precise. Here it may be an idea to fine tune the elevation setting for optimum reception. Many dishes will have degree markings on the side, though these are only accurate if your dish is mounted perfectly vertically. If you find that you’re struggling with the fine tuning, you could attach a turnbuckle to your dish, which will allow you to smoothly alter the elevation or rotation in minute quantities. Now’s the time to check if it’s worked. If not, be patient. It can take some practice and in no time at all you’ll have it down to an art. Obviously it’s easier to get it right if you can see the TV in front of you but this is often not possible. It may be an idea to have someone shout out how it’s going (though please be conscious of other holiday makers). It may not be for everyone, but caravan TV can be fairly straightforward to set up and very rewarding if you have the right equipment and the patience to perfect the art.